The most basic use of MATLAB is to use it as a fancy MATLAB calculator. This simply means we can execute mathematical operations in the command window much like you would with a handheld calculator. into the command prompt. For those who are new to computer programming, learning to input expressions correctly in the inline format can be difficult and will be the source of many frustrating MATLAB errors. I promise this will become much easier the more you practice! In addition, MATLAB always works from left to right, including commands that have equal precedence. The sign for both entering a negative number and performing subtraction is the same. Finally, one of the common mistakes I see for beginning programmers is forgetting that there are no implied operations in MATLAB. For example, you cannot multiply 10 by 2 by entering 10(2). You must enter either 10*(2) or simply 10*2. A useful feature in MATLAB (and in all computer programming languages for that matter) is the ability to store and recall data using variables. To do this in the MATLAB command window, simply type in a variable name followed by the equals sign and the number or expression whose result you wish to store. The stored value can now be retrieved (even for use in another expression) by simply using its name. Here it is important to note that assigning a new value to an existing variable will overwrite its existing value (which is sometimes desired). MATLAB variable names must begin with a letter and can contain upper/lower case letters, numbers, and underscores (_). The picture below demonstrates some basic usage of variables in the command window. Notice that the value corresponding the variables can be seen in the workspace pane? 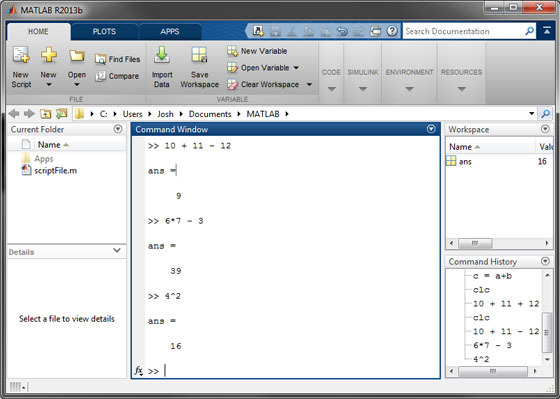 MATLAB has a number of built-in mathematical functions. These functions can be called by entering the function name immediately followed by the argument/input surrounded by parenthesis (for example functionName(inputValue)). Some common math functions available in MATLAB are given in the table below. In addition, some built-in functions do not take any input, but rather act like built-in constants. For example, entering pi returns the value of to many decimal places of accuracy. In addition, the constants i and j return an imaginary number, which can also be obtained by entering sqrt(-1). You can quickly obtain help for any built-in MATLAB function by entering help functionName at the command prompt. Try this to see what MATLAB has to say about the <asind function. By pressing the up arrow key on the keyboard you can retrieve expressions or commands that have been previously entered in the command window. This is useful if you find an error in a long expression. You can simply cycle back to the expression and make the correction without retyping it. Lets now move onto the next part of the tutorial where we will learn to program using MATLAB script files: Using MATLAB Script Files.